With the all-new, fifth-generation 2019 Toyota RAV4, the vehicle premieres, yet again, at the forefront – both for the Toyota brand and for the segment. Dealership arrivals can't come soon enough, with 2019 RAV4 gas models set to arrive in December, and RAV4 Hybrid models following in late March 2019. The first RAV4 was a true game-changer, but no one knew at the time just how big of a market shift it would create. RAV4 is the currently the best-selling vehicle in its class, doubling volume over the last five years to sales of nearly 408,000 in the U.S. in 2017. That makes RAV4 Toyota's best-selling vehicle in the U.S., and the best-selling non-pickup truck in the country. New RAV4 powertrains increase performance while reducing fuel consumption. Second-generation Toyota Safety Sense (TSS 2.0) comes standard. Beneath the 2019 RAV4's bolder sheet metal, the Toyota New Global Architecture (TNGA-K) platform provides the robust foundation for capability, comfort and safety. The longer wheelbase and wider front and rear tracks provide a stable, confident driving platform. Shorter front and rear overhangs aid the RAV4's trail driving capability. 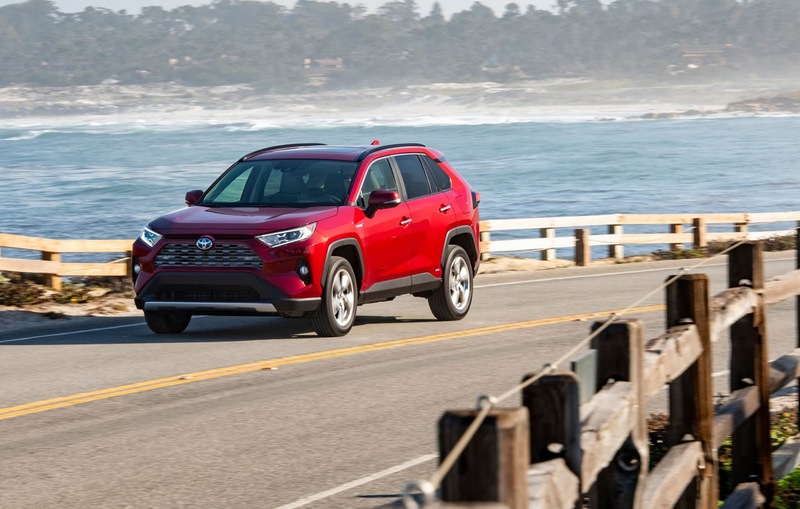 Power and efficiency both make a leap in the 2019 RAV4 thanks to the new 203-horsepower Dynamic Force 2.5-liter inline-four-cylinder engine paired with an 8-speed Direct-Shift Automatic Transmission in the gas models. In the RAV4 Hybrid, the engine is teamed with Toyota Hybrid System II (THS II) with Electronically-Controlled Continuously-Variable Transmission (ECVT) that generates 219 combined net total system horsepower. The RAV4 Hybrid also is the efficiency leader of the lineup with preliminary manufacturer estimated mpg of 41/37/39 (City/Hwy/Comb). In addition to standard front-wheel drive, RAV4 gas models offer two types of available all-wheel drive. The new, segment- and Toyota-first, Dynamic Torque Vectoring All-Wheel Drive with Rear Driveline Disconnect comes standard on AWD-equipped Limited gas and Adventure grade models. No matter the grade, every RAV4 is a winning choice, whether it's for a city exploration, a weekend trip to the countryside, or a jaunt on the trails. With five gas models and four hybrid models, the 2019 RAV4 arrives at dealerships with an option for everyone. *MSRPs exclude the Delivery, Processing, and Handling (DPH) Fee of $1,045.